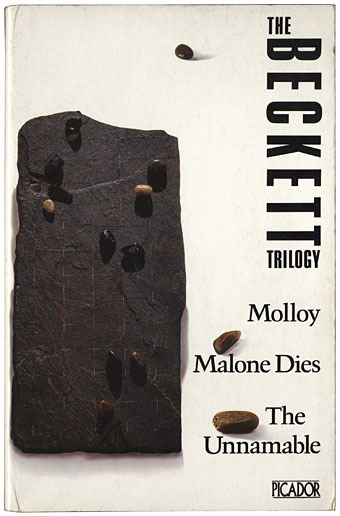 This 1979 Picador edition of The Beckett Trilogy is one of my favourite paperback cover designs. The “illustration” (as it’s described on the back) is a photograph of an artwork by artist/designer Russell Mills and the minimal credit gives no indication as to whether it was Mills who was responsible for the striking type layout. I’ve noted previously the equally striking Picador designs by the Quay Brothers who were responsible for both art and layout on their covers. Mills extended his work into graphic design later with album cover designs (and some book design) for Brian Eno, David Sylvian, David Toop and others so I’ll give him the benefit of the doubt in this case.